I was always thinking of starting a blog, but the thought of ranting my thoughts to total strangers just didn't click with me. Soo..instead, I'll be starting a sketch blog. I'll be posting (regularly I hope!) my sketches, ideas etc. Yea I know it ain't somthing groung breaking, but hopefully, it'll serve as a pushing point(lack of a better word) for my drawing. Also, its gonna be a stand-in for my now defunct website, till I get a new one. 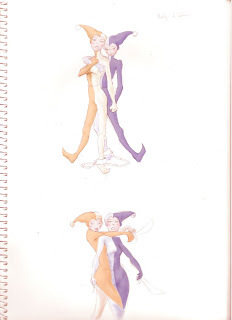 Well, to start off, here's a pair of jester twins. Hmm nothing much to say about them, cept that they're kinda like siamese yet they're not..suppose to be from this collection of circus freaks I had in mind. The rest just didn't stick as much as these two. Ugh, I'm new to this whole blogging thing so till I get used to this "exposure", you've gotta bear with me.